I’ve recently got a 7 inch clay doll so I set to making her some dresses. These dresses are about 5-6 inches from neck to hem so pretty small and I know I was daunted by the size. I also have noticed that many clothes in this size are stretchy material or crocheted and knitted. So I tackled cotton and fully machine sewed it too. 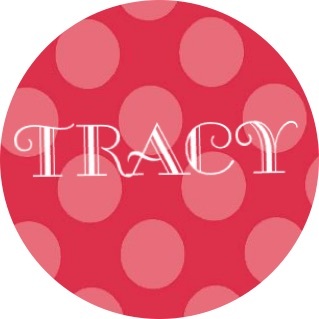 I probably wouldn’t attempt smaller on the machine but here’s my how to. 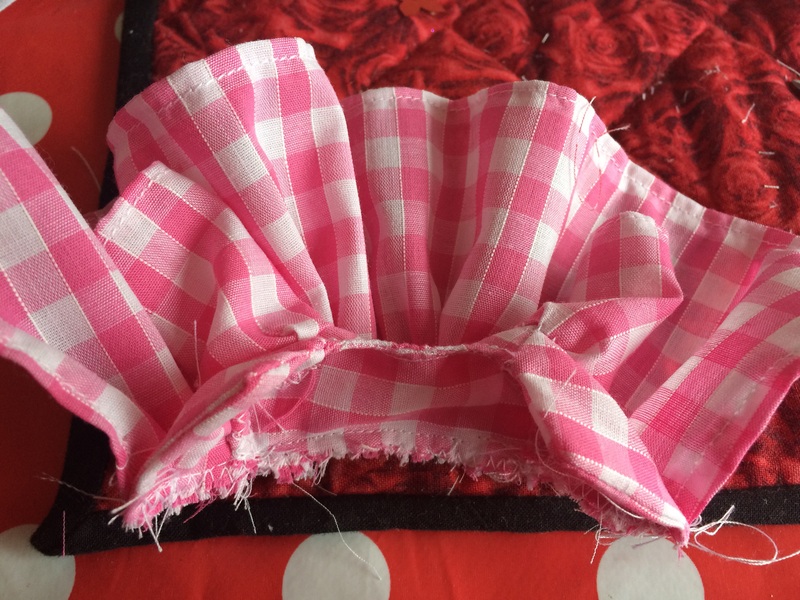 When you decide on a pattern and reduce it using my handy guide you should have 2 fronts and 4 backs plus a skirt that should be the length from your dolls waist to knees (or longer if want it to be ) plus 1 cm for joining to bodice and another 1-2 cm for hemming. The skirt should be at least 2 times the waist measurement plus 2cm for the back seam as this will be kept open. The key to dressing small and especially rigid dolls like a clay doll is open back clothes. Anyway back to sewing you need to attach 2 backs to a front at the shoulders. 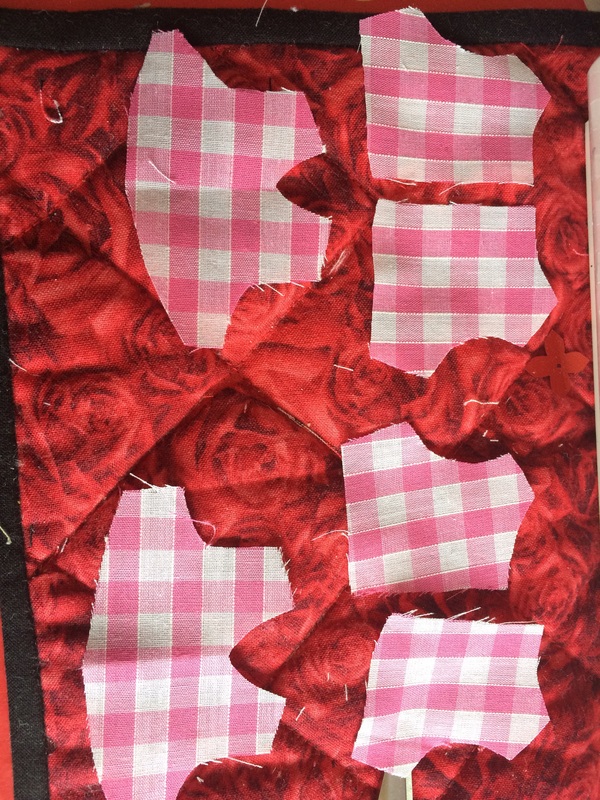 Make sure the straight edges of back face each other and repeat for other pieces. You will now have 2 bodices unsewn at the side. 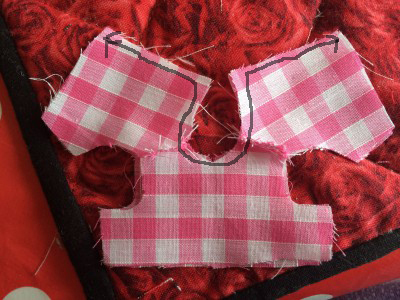 Lay them right sides together and sew where lines indicate: along back opening and neck. Turn right way out and top stitch neck. As you have such a tiny seam allowance and it’s a curve I chose to top stitch to strengthen it and prevent fraying. 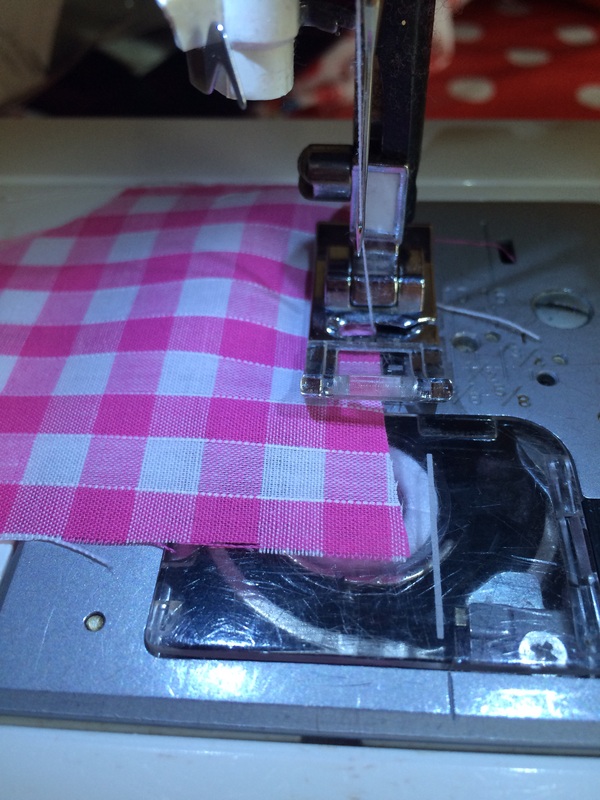 Now onto sleeves you can always double hem this but I zigzag stitch the straight edge, turn up and sew in place. That’s your sleeve hemmed. It’s much easier to do flat. 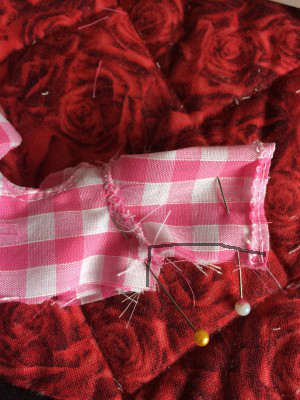 Find the centre by folding and pressing with your finger then match this to the shoulder seam on the outside of bodice. Pin in place, it will curve slightly as you pin. Sew and zigzag stitch over to strengthen. Now once both sleeves you need to match the seam (yellow pin) and line up sleeve hem and sew where line indicates. Once sewn I find it useful to clip the cuff seam at a slight angle. I find if I don’t when I turn the sleeve out the seam can tend to peep out sometimes. Doing them then zigzagging or serging helps stop that and makes doing sleeves this flatter way just as neat. Nearly there. Next job is the skirt. after zigzag stitching 3 sides (one long & two short) I turned the long edge up then the short ones. Similar to the sleeve I find this neater as nothing feels the need to poke out. Sew in place. You will need to gather your skirt now using your preferred method. 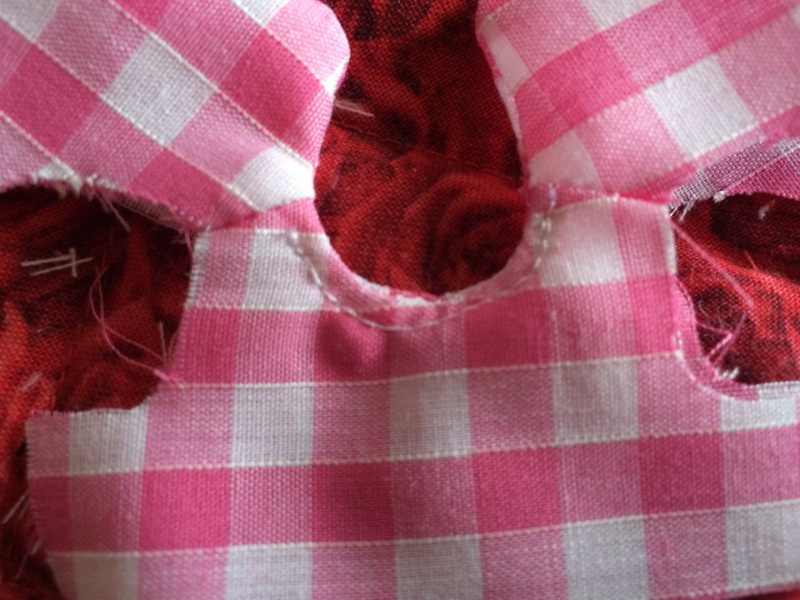 I tend to hand sew this no matter the size of doll as I just find it quicker for me. Pull to size and attach right side of skirt to right side of bodice. Sew and zigzag over edge to complete. Finally add a fastening by the neck. You could brave tiny buttons but small strips of velcro or a hand sewn popper/snap are best. Hope you liked this tutorial. 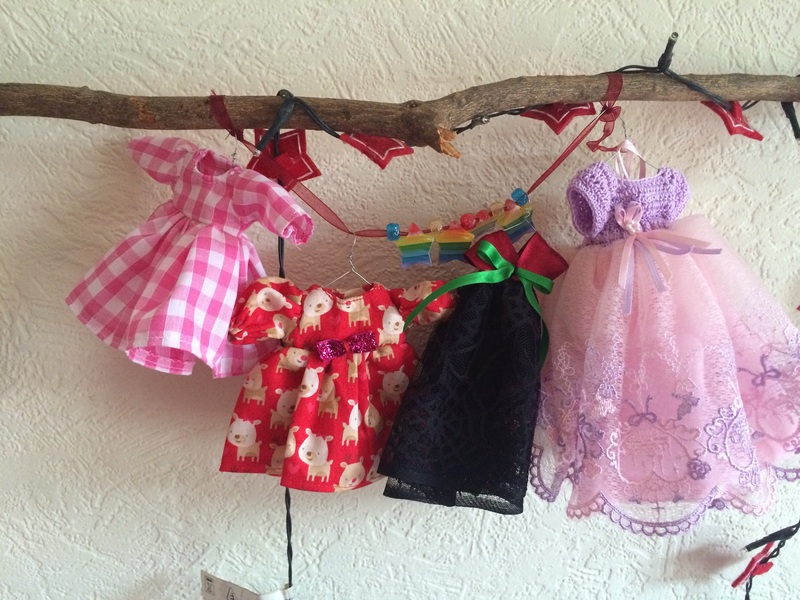 The best bit I love about doll clothes especially this size is you can use tiny scraps of material and most doll clothes you can make with a FQ as your biggest piece. Perfect! The red dress was done using same pattern as this dress but I chose to add extra to middle of sleeve and elasticate the cuffs. 30 days of blogs BONUS!